The main reason I've cooled a bit on The Untouchables, however, is that I've simply seen a whole lot more films now. I have a better handle on what I think is great, and what I think is good, and what I think is trash. And I've even seen De Palma beaten at his own game with Inglourious Basterds. 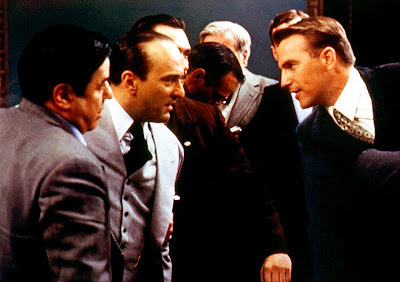 I just have too much experience with the vast world of movies (though still not nearly enough) to think that The Untouchables is the masterpiece I thought it was 22 years ago. There was also a period where, outside of this film, I'd decided that I really disliked De Palma. But the experience and knowledge I've gained has shown me that De Palma is actually a weird kind of genius -- his films are inconsistent, frustrating, sometimes out-right terrible, but he's still a genius of a particular sort... Read more here. Also, here is a two-part post that gets a little too obsessive with the film's famous "Odessa Steps" sequence: And so it begins... by Randy Aitken at HiMiPoV And so it begins... (Part Two) by Randy Aitken at HiMiPoV Join us later for the results of our poll, and my own contribution to the Blog-A-Thon. I just want to thank you for all your hard work in assembling so many pieces and links to great essays on De Palma. Your passion for the filmmakers films is palpable, and shows in the impressive way you've hosted this blog-a-thon. Your efforts are greatly appreciated...and I think speak for all of us cinephiles in the blogosphere that you're efforts here have not gone unappreciated. Interesting. I've always liked The Untouchables ok but it never really worked for me - I like darker, grittier gangster films, more passionate ones like De Palma's own Scarface (that film was for me what Untouchables was for Bill R. - the "one" De Palma film I thought I really liked, while not "getting" the others).